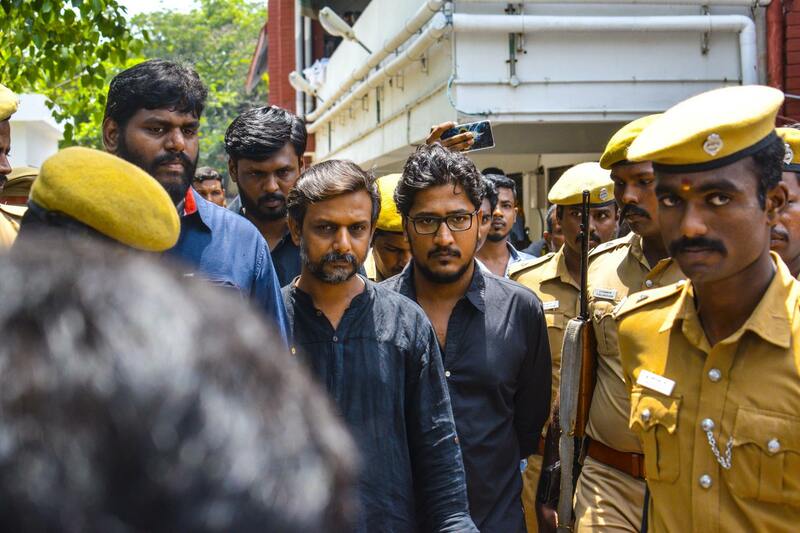 The Chennai High court bench quashed the Goondas case on rights activists Thirumurugan Gandhi, Daison, Ilamaran and Arun Kumar today. The Activists were arrested in May for conducting a candle light vigil in Marina beach to commemorate the genocide of Eelam Tamils. Following the arrest cases under sections 147,148, 143, 188,341 and 506 [ii] IPC r/w 7[i] CLA act and sec 3 of TNPPDL act were filed on Thirumurugan Gandhi, the chief co-ordinator of May 17 Movement and other comrades. Subsequently Goondas act was used and activists were jailed in the Puzhazh prison. The Tamil Nadu government used the notorious Goondas Act, a detention law to imprison the Activists to quell the dissent it was facing on numerous issues in TamilNadu. There was no legal ground for the case from the very beginning. None of the sections that were used against the comrades even came under the Goondas act. But still the TamilNadu government went ahead and used the detention act. Once the goondas charge sheet has been filed the accused has the right to file a response in 12 days giving his reason why the case is invalid. But even before a response was filed the Police commissioner conducted a press meet saying that use of Goondas on the activists was right. Also when the response was submitted by the activists the police had an obligation to file a counter response in 5 days. But it took more than 10 days to get back with their side of arguments which itself showed how the Tamil Nadu government was squabbling to find back itself in this hastily filed case. For more than 100 days the comrades were behind bars. The case was delayed on flimsy reasons. Today when the high court took up case after hearing the arguments from both the sides the High court quashed the detention of activists Thirumurgan Gandhi, Daison, Ilamaran and Arun Kumar under Goondas Act. The activists are expected to be released tomorrow. Some weeks back, Valarmathi a student activist who was arrested under goondas for distributing leaflets against the Hydrocarbon extraction project in Tamil Nadu was released by the High court. Tamil Nadu has been on the boil over various issues for the past years as a result of the conflict between the peoples interests and that of the corporate-state. The release of activists Thirumurgan Gandhi, Daison, Ilamaran and Arun Kumar comes as a streak of hope in an overall climate of repression that the activists throughout India are facing.